Throughout the two and a half years that I have been living in Italy, one name has kept popping up every now and then catching my attention and kindling my curiosity. With the accent on the ‘o’, I hasten to add. There was the visit to Vicenza’s splendid Palazzo Leoni Montanari where, as a part of a temporary exhibition exploring the destructive character of war, I came across two sculptures which had been severely damaged by bombings in 1917. The sculptures had strong classical features which made you stop and look at them for a little while. They had a presence and grace that stood out in spite of them being surrounded by dozens of other pieces of priceless art. A small square paper sign discreetly placed next to the sculptures, indicated Antonio Canova as their creator. Up until that very moment, I admit, I had never heard of him. It sometimes pains us to confess our shortcomings, but, yes, here is one of mine. In Italy – a country so renowned for its painters, sculptors and generally people of art – until that very moment in time I hadn’t come across one of the greatest of them all. Antonio Canova was born in 1757 in a small village called Possagno in the province of Treviso in the Northern Italian region of Veneto. By the time of his death in 1822 he had become famous for his neoclassical marble sculptures which look like they belong in an Ancient Greek pantheon. Canova carved sculptures for the most well-known people of his time (among them Napoleon), had a studio in Rome, travelled across Europe and, as a matter of fact, was the very person who suggested that the British Museum should acquire the Elgin Marbles from Greece. A few months after that very first encounter I had with Canova’s art, I found myself in the Basilica dei Frari in Venice, standing in awe in front of a pyramid made of gleaming white marble. It had a sturdy, tightly closed door on both sides of which stood an impressive sculptural group – a winged lion, an angel, and representations of Death, Hope, Clarity, and Immortality. As it turned out this was the tomb designed by Canova for the great Venetian painter Titian and instead where Canova’s heart had been laid to rest. Since then I kept coming across Canova’s art and name. And the more I learnt, the more I wanted to know. Little things kept my curiosity alight. 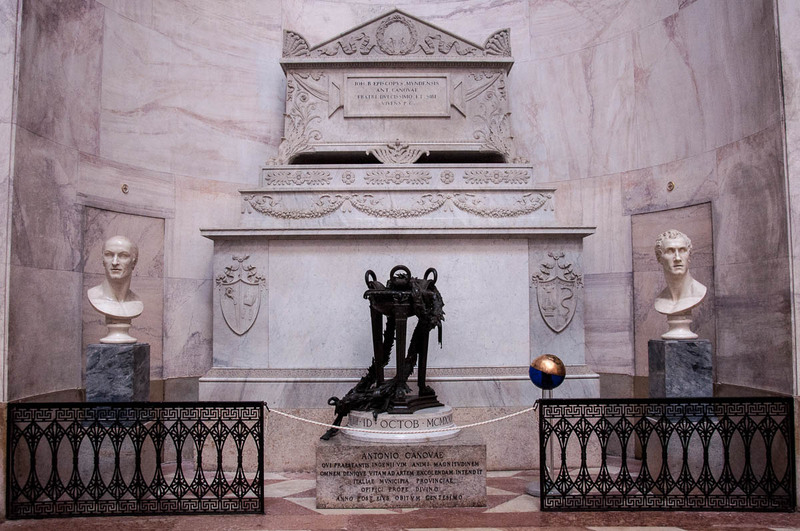 Like, for example, the fact that the sculptor has three resting places: with his heart in the Basilica dei Frari and his right hand preserved in a vase in Venice’s Accademia di Belle Arti, his actual tomb is in the neoclassical temple pictured herewith which he built in Possagno – his birthplace. 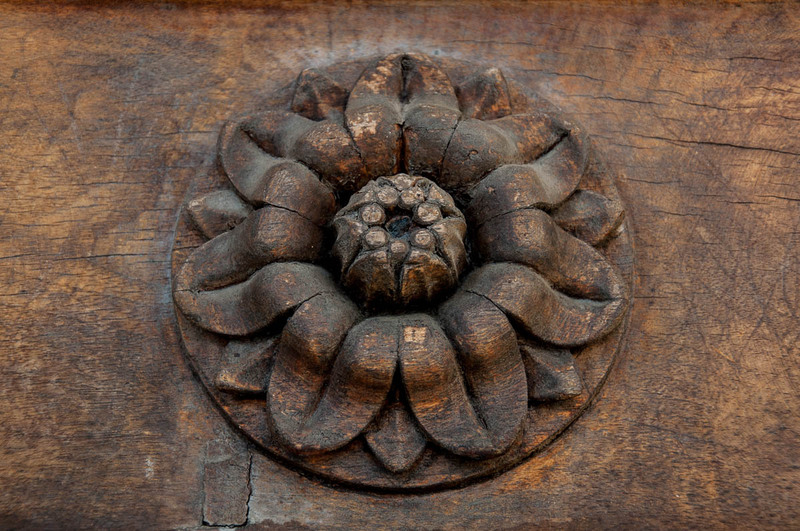 Or, like the fact that he started carving marble very young under the guidance of his paternal grandfather who was a stonemason, a sculptor, and owned a quarry. Or, the undeniable truth that Canova’s work looks so perfectly classical in its proportions, aesthetics and themes that it is somehow difficult to grasp the notion that he lived less than three centuries ago rather than three millennia. 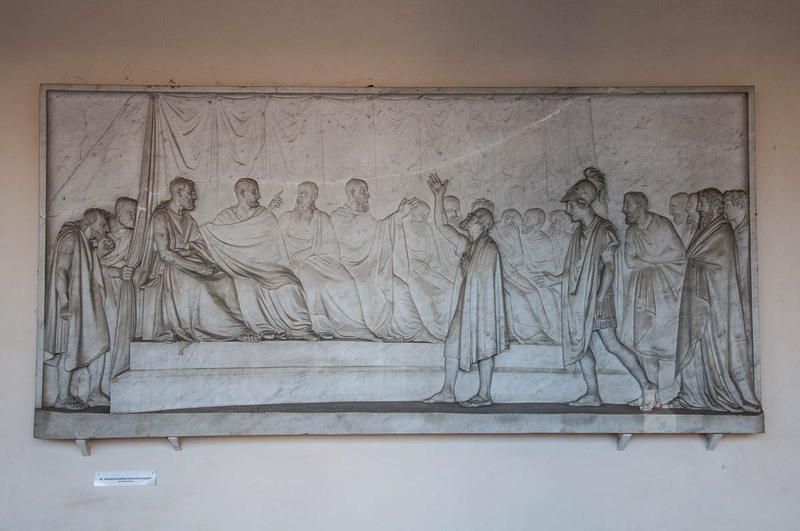 And, above all, the fact that Canova, famous mainly for his marble sculptures, was also a consummate man of the arts finding an outlet for his creativity also as a painter, etcher and architect. 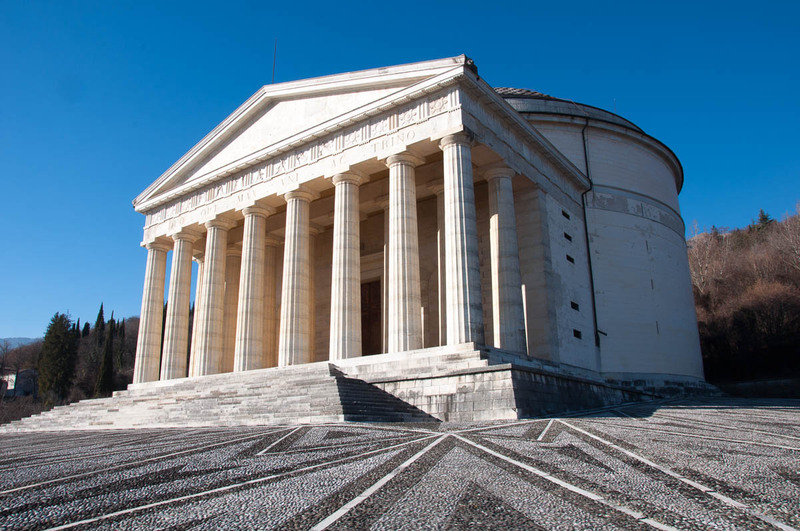 So, when I found out that Possagno is only about an hour away from our current hometown of Vicenza, I couldn’t wait to visit and see Canova’s birthplace and temple for myself. The perfect opportunity for such a trip presented itself last Saturday. It was one of those days when we woke up unsure as to what to do with the day ahead. The week had been long and exhausting and logic dictated that we should stay in, maybe do a bit of shopping and generally take it very easy. It is this feeling that takes hold of us every now and then and makes us pile in our little red car and go explore little villages and mediaevil towns, and discover the wonders of Italian nature, cuisine and art for ourselves. I love days like this. They make me feel so alive and like I am doing something useful and precious with my life. 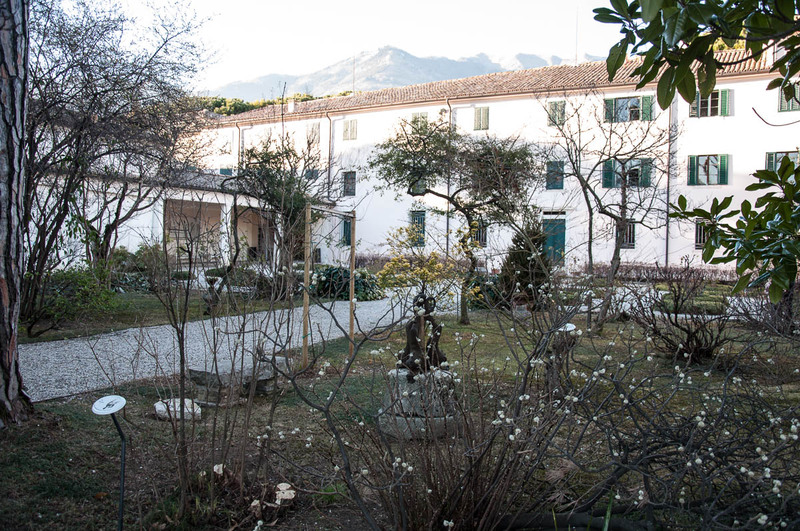 So, last Saturday was one such day and, as luck would have it, we didn’t spend an hour trying to agree on where we would head to as I had the perfect destination in mind – the village of Possagno with Canova’s birth house, the adjacent gallery with original plaster casts of his work and the temple with his tomb. As all our adventures begin, we piled in our little red car and after punching P-o-s-s-a-g-n-o in Google Maps, we set off, all the while arguing about the correct pronunciation of the sculptor’s name. One of us was sort of convinced that the stress fell on the first ‘a’ whereas the other couldn’t make up their mind, and the third didn’t have an opinion on the matter at all. So, it was eventually accepted by everyone in the car that it is ‘CAnova’ and only later, after ‘CAnova-ing’ all through the day, we found out that it is in fact ‘CanOva’. So, don’t make our mistake! The drive to Possagno was otherwise uneventful and quick and before we knew it, we were gliding through the village and then the street turned sharp left and led us up a very steep hill. Houses were perched on both sides of the wide road and the jagged line of the pre-Dolomites served as a majestic backdrop of the splendid view ahead of us. All we had eyes for though was the white temple waiting for us a top of the hill. It was like we had been transported both to Athens and Rome at the same time. 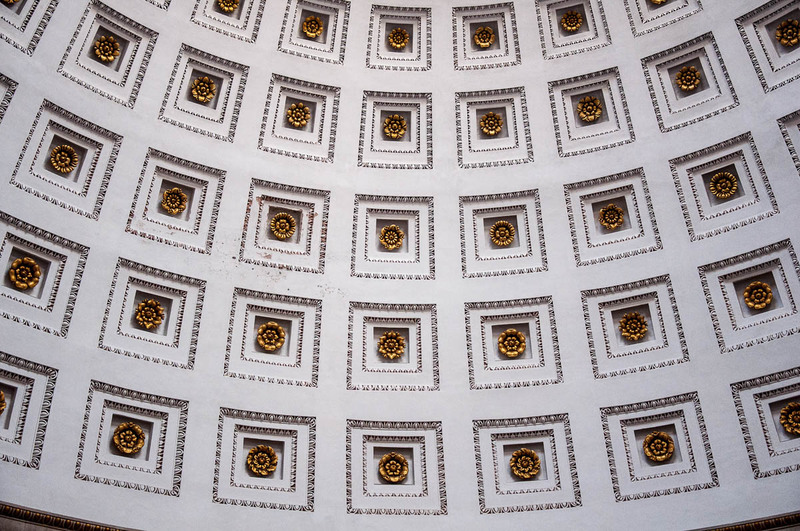 A circular building with an oculus on its round dome was pre-faced by two rows of tall, proud Doric columns crowned by a triangular pediment. 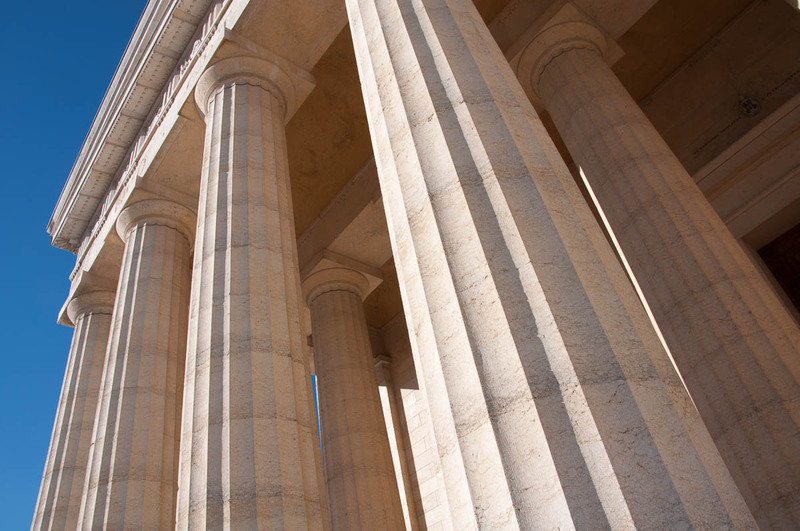 It was the perfect marriage of Athens’ Parthenon and Rome’s Pantheon. 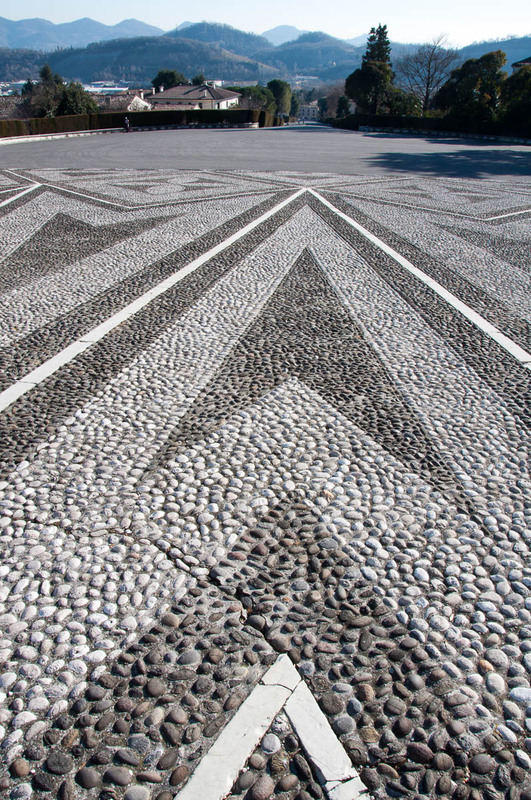 A three-tiered sloped pavement with an elegant geometric pattern made up of black and white river pebbles surrounded the temple emphasising the cleanliness of its lines. It was all very peaceful and quiet. No people were around bar two young local men who were using the slight slope of the parking space to practise their skateboard routines. A beautiful view opened up towards the mountains surrounding us with their jagged peaks on all sides. 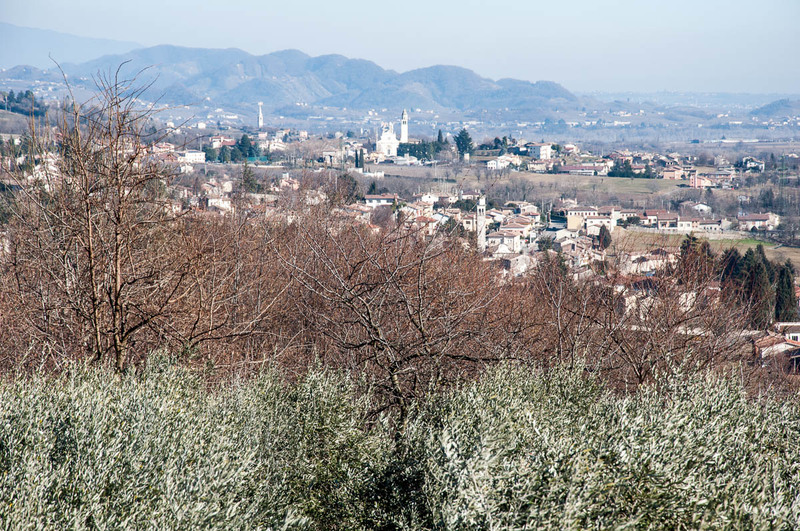 Olive groves stood at the bottom of the crowned by the temple hill and in the near distance we could see picturesque Italian villages with their churches and bell towers. We walked up the pebbly pavement to the steps leading all the way to the temple. Every step I took I stopped to admire it all. It was beautiful. Once on top of steps we chose a sunny spot and sat down next to one of the 16 thick columns to relax and to savour the moment. It was half past one and the temple would open at 2 pm according to the small note attached to its mighty, over seven meters tall main door. 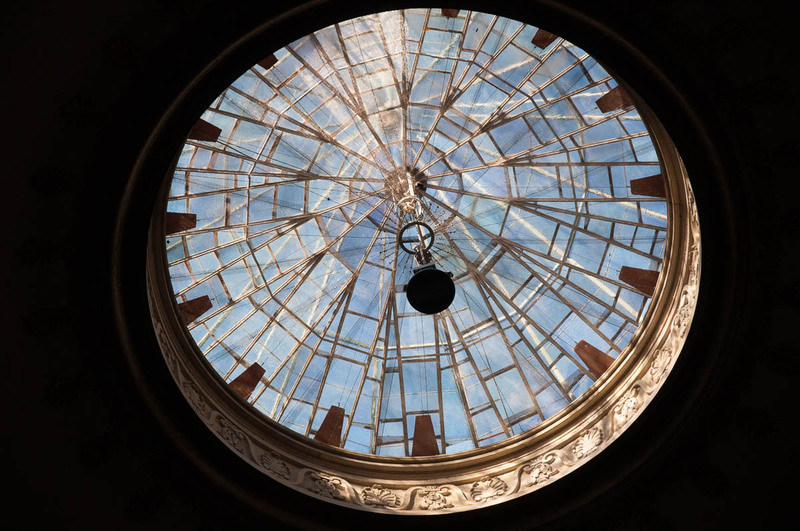 We could have gone to explore the village a bit or head down to Canova’s birth house and plaster cast gallery which are open all through the day, but instead we decided to simply stay there, on those steps under the warm glare of the sun. It was glorious! Peaceful, silent, relaxing and re-energising at the same time. I live for moments like this one. Apparently, Canova designed the temple with the view of it housing his statue of Religion. 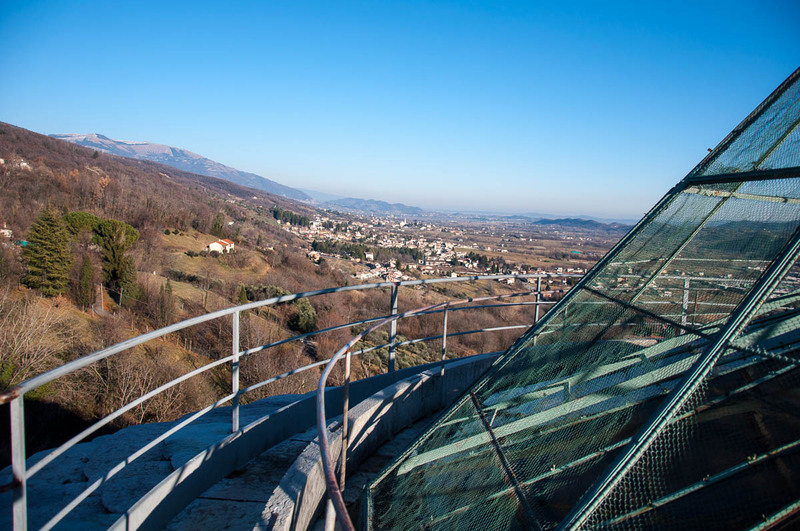 Initially, he wanted the statue to be placed in Rome’s St. Peter’s Basilica, but after his proposal was rejected, he decided to build a temple in Possagno and have it there instead. 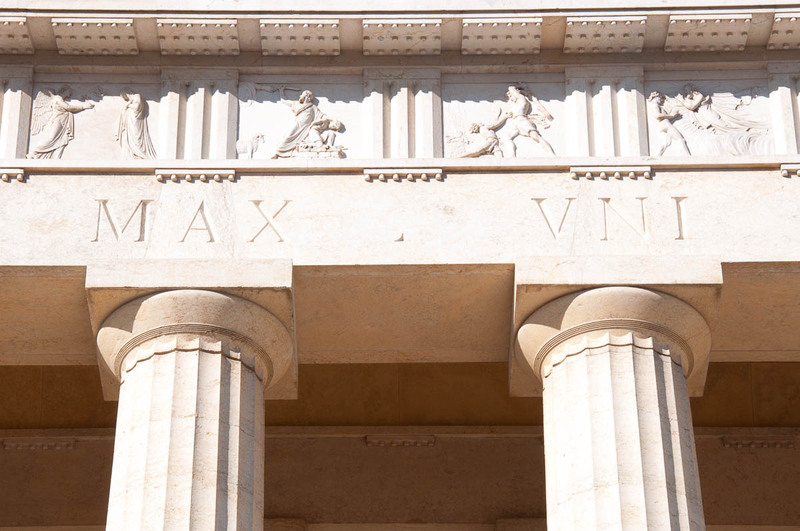 Between 1804 and 1818 Canova designed the temple and building works started in 1819. 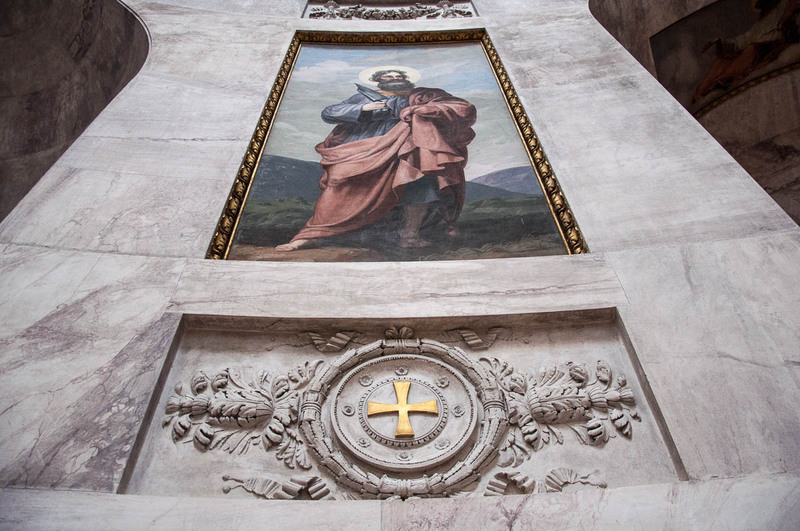 The sculptor, dressed in a red Papal uniform and decorated with all his medals, laid the foundation stone. Unfortunately, the temple was only finished in 1836 – 14 years after the sculptor’s death. Yet Canova invested all his creativity in this project, financed it and would visit it every autumn to encourage and reward the builders working on it. For a man who had created sculptures for royals and aristocrats, who was lauded both in Italy and all over Europe, this temple was his crowning glory, his swansong, the symbol of the perfect circle he had performed in his life – being born in Possagno and returning to it for his eternal rest. At 2 pm the caretaker of the temple unlocked a little side door which led us inside through a tiny corridor. 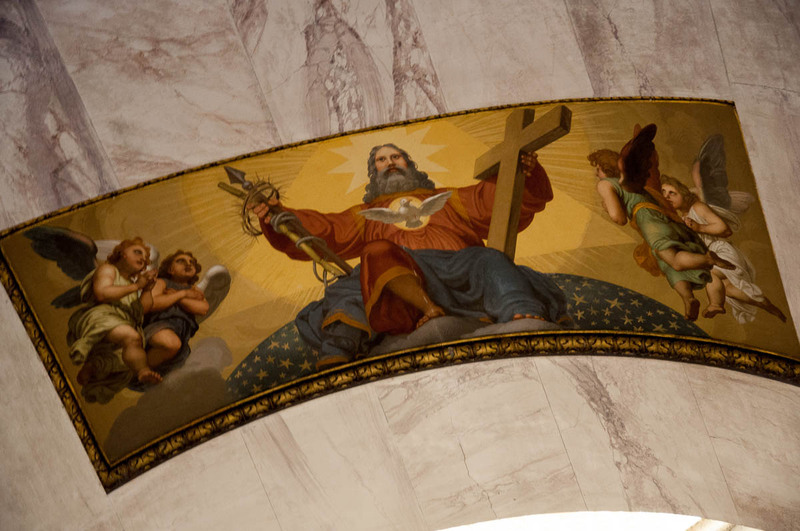 We found ourselves in a perfectly circular Roman-Catholic church. 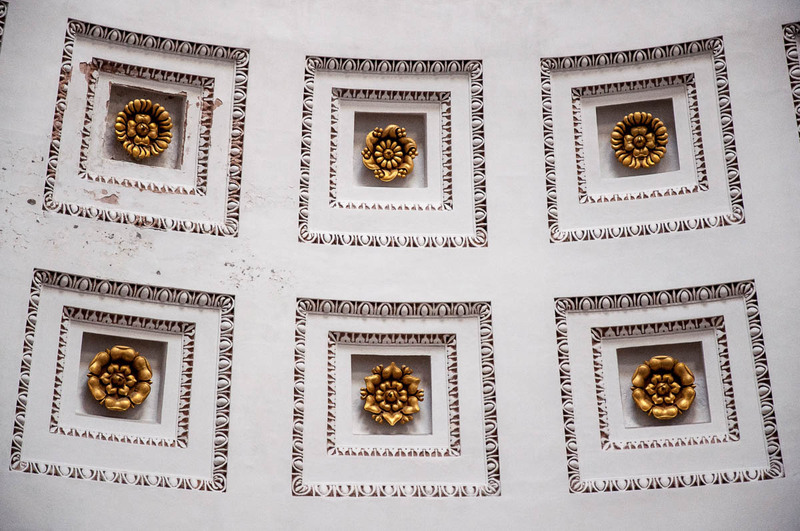 I was instantly taken with its ceiling – a gleaming white hemisphere resting on a golden frieze and decorated with 224 gilded roses carved out of wood in 14 different styles. 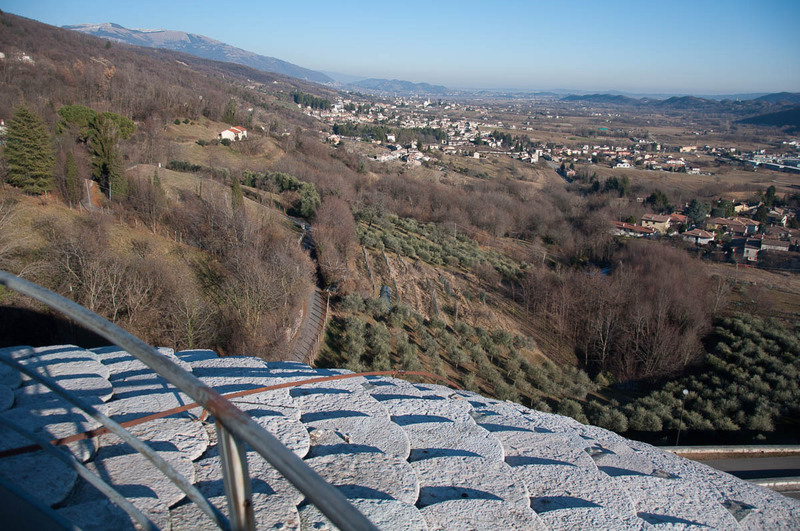 The floor was made from red and white marble from the nearby river Piave. 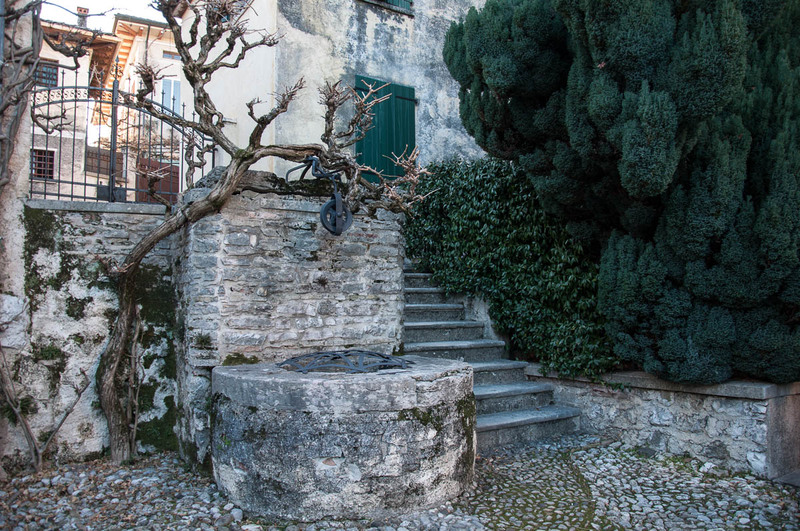 A porous stone, called lumachella and extracted from the hills a few miles south of Possagno, had been used extensively in the building works. 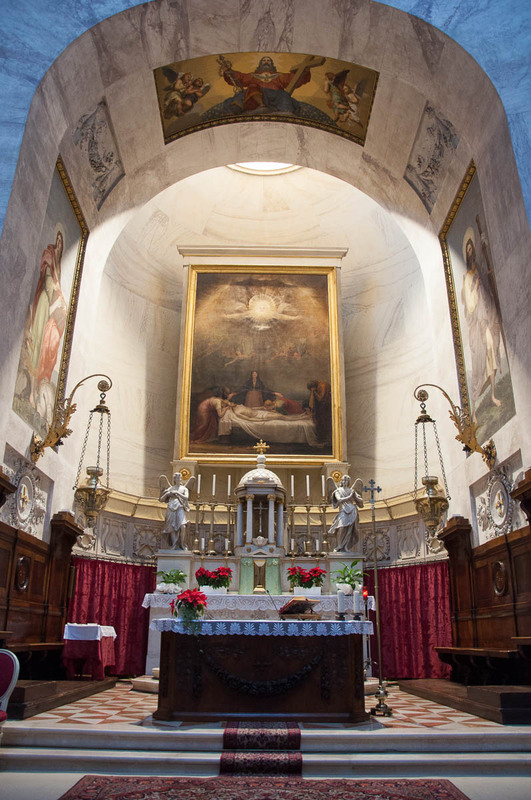 Paintings and frescoes by great masters were positioned around the church. Among them, the one with the biggest impact for me was ‘The Deposition’ by Canova himself which was placed behind the main altar. 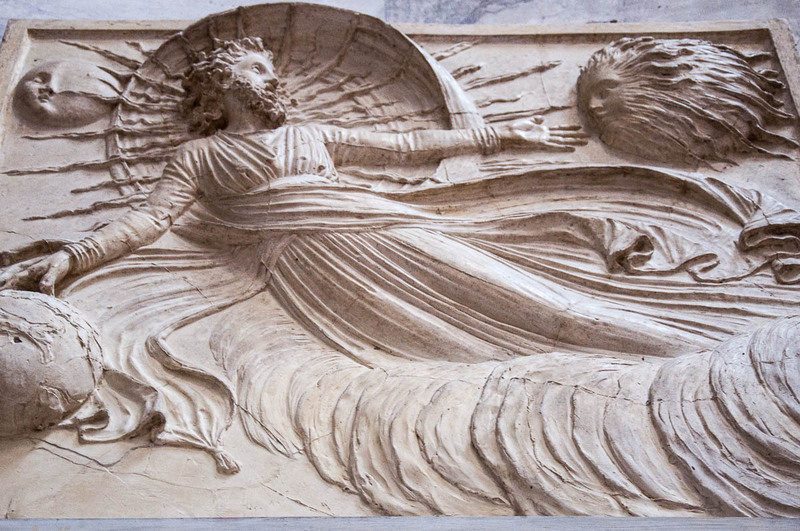 Bas-reliefs also by Canova, like this ‘Creation of the world’, also adorned the walls. On the right a bronze Pieta commanded the gaze. 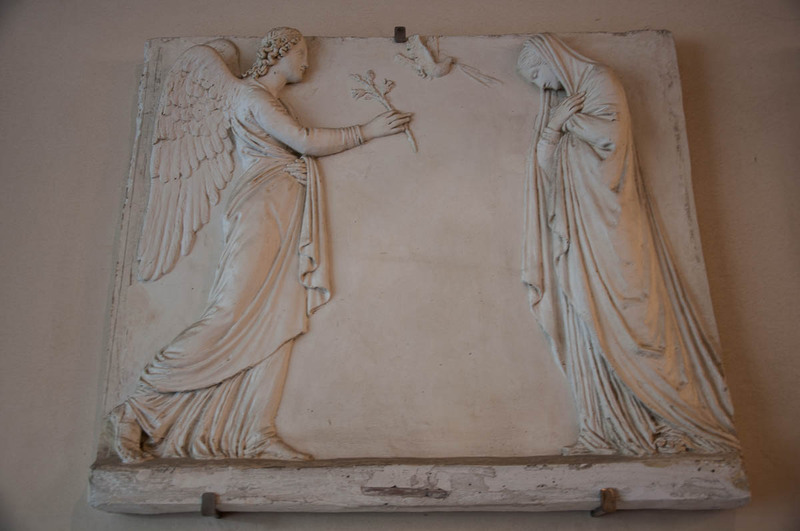 Originally, the sculpture had been cast in plaster by Canova. Unfortunately, he died before he could carve it out of marble and at a later stage it was cast in bronze by Bartolomeo Ferrari – another sculptor from nearby Marostica – who was commissioned by Canova’s brother. 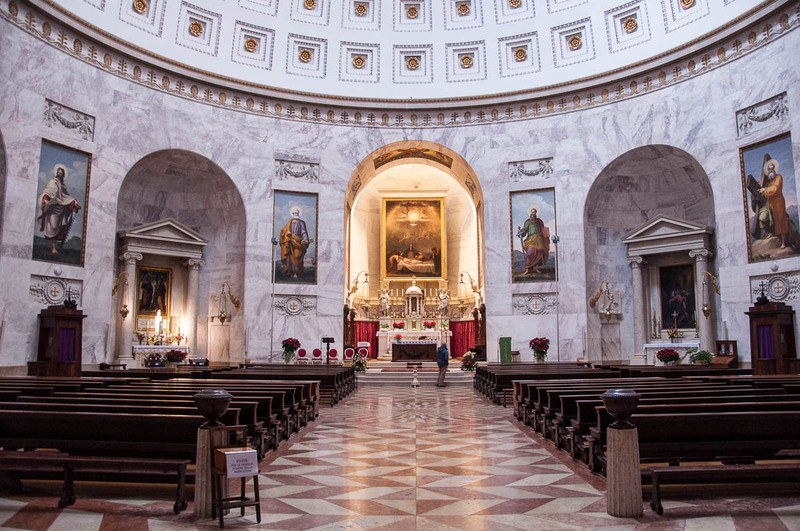 Canova’s tomb was to the left of the altar and it was flanked by busts representing the sculptor and his half-brother Giovanni Battista Sartori Canova (who was also laid to rest there). On the stone sarcophagus I noticed a coat of arms. It said ‘Orpheus and Eurydice’ and underneath their names you could see Orpheus’s lyre and a snake. Curious as to this Thracian link, I asked the caretaker about the connection between the coat of arms and Canova’s work. He explained in rapid Italian (which I couldn’t follow 100%), that two of Canova’s most famous sculptures indeed represent Orpheus and Eurydice and that the sculptor had adopted the mythological figures as an inspiration and symbol of his work. Next, I asked the caretaker if it was possible for us to go to the roof of the temple, as we had read that the views from up there were unparalleled. ‘You don’t pay, you don’t go!’, he sort of snarled at me. ‘But, of course, we will pay!’, I sort of stammered and tried to lighten up the mood. I am not sure why he thought that I would be trying to circumnavigate the obligation to pay. It must have been my hardened criminal face. 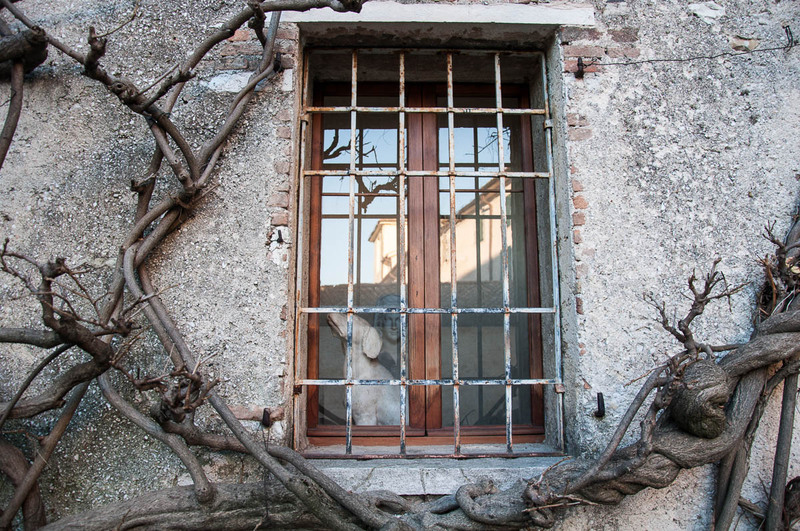 Anyway, we paid the fee – 1.50 euros a head – and the caretaker opened a secret door behind his back. We followed the route through the corridors and up the stairs contained in the eight-meter-thick outer walls of Canova’s Temple. Guys, up there it was amazing. The view was fabulous. 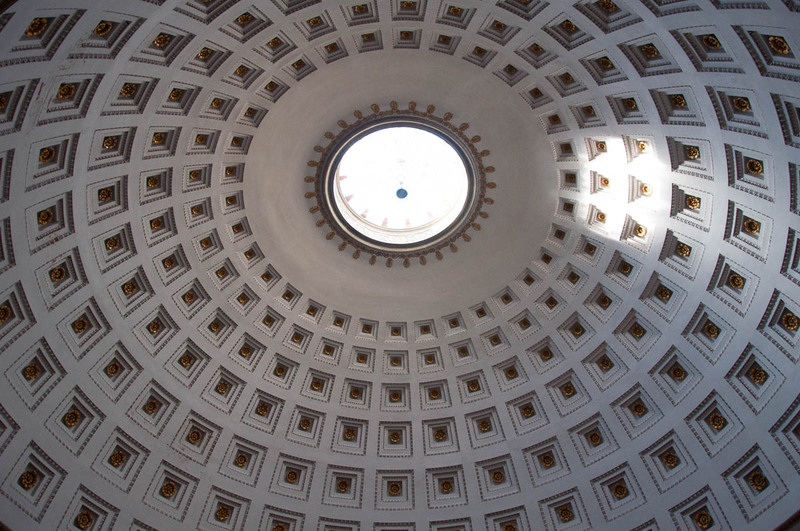 Seeing the roof covered in overlapping stone slabs up close was great and made me appreciate Canova’s talent even more. But, it was quite scary, too. I held on the metal railings for dear life. Plus, when I turned to go down I was faced with this. 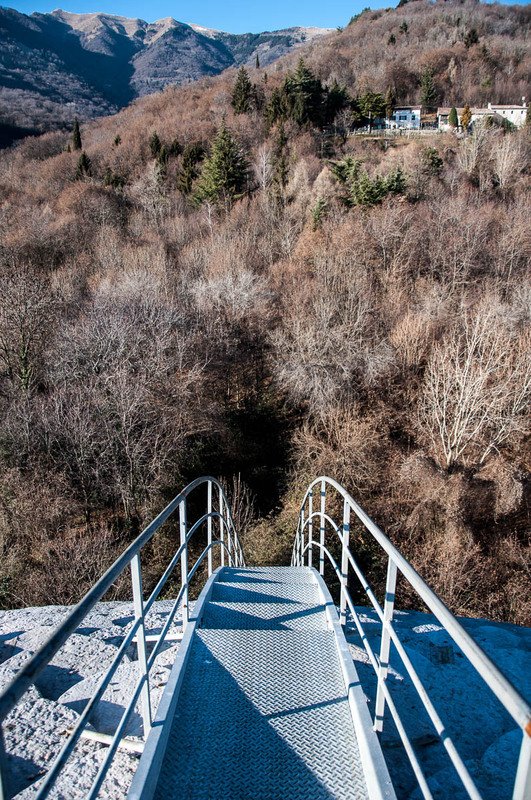 It was like the steps disappeared off into the abyss and I was about to plunge into the great unknown. It was just a visual illusion though, so taking step after shaky step, I safely reached the ground. 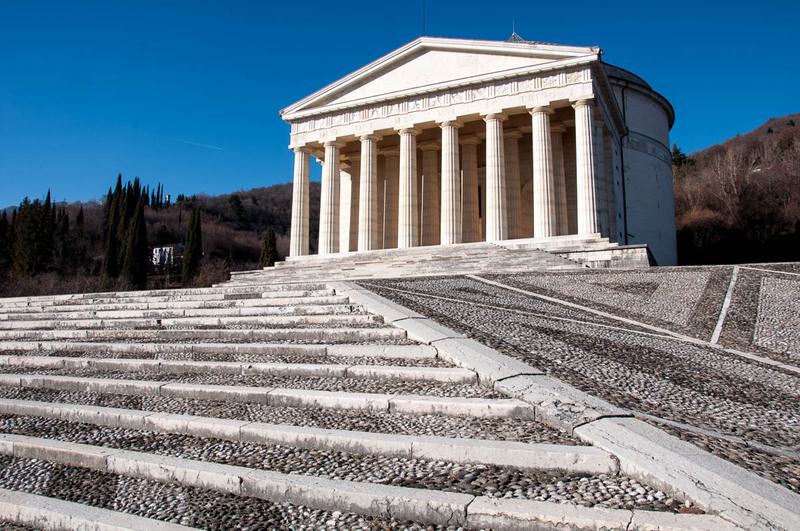 Once our visit to the temple was complete, we headed back down to the bottom of the hill where, facing the temple on the top of it, stood Canova’s birth house which now functions as a museum. 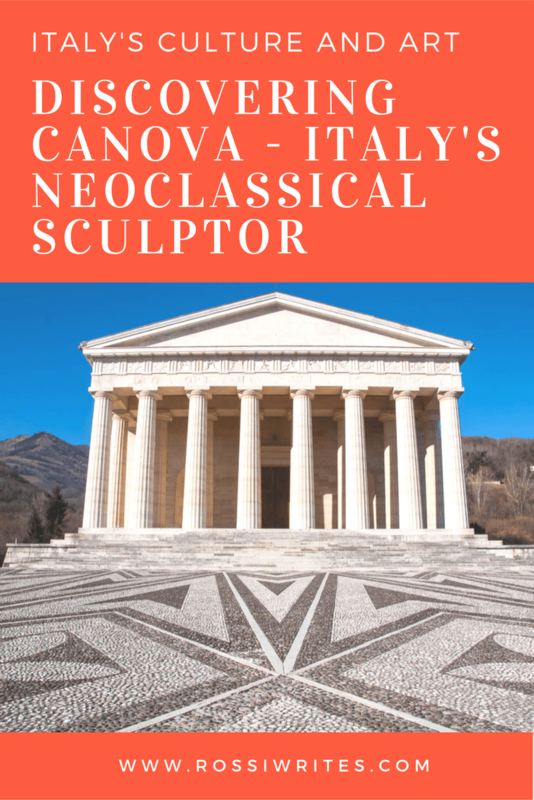 The entrance ticket was 10 euros a head and it gave us access to the sculptor’s house, the adjacent garden and the Gypsotheca – a fabulous white gallery with high curved ceiling where the original plaster casts, created by Canova for his marble sculptures, are housed in one place. Photos were not allowed inside, so I can only show you what the garden looked like. 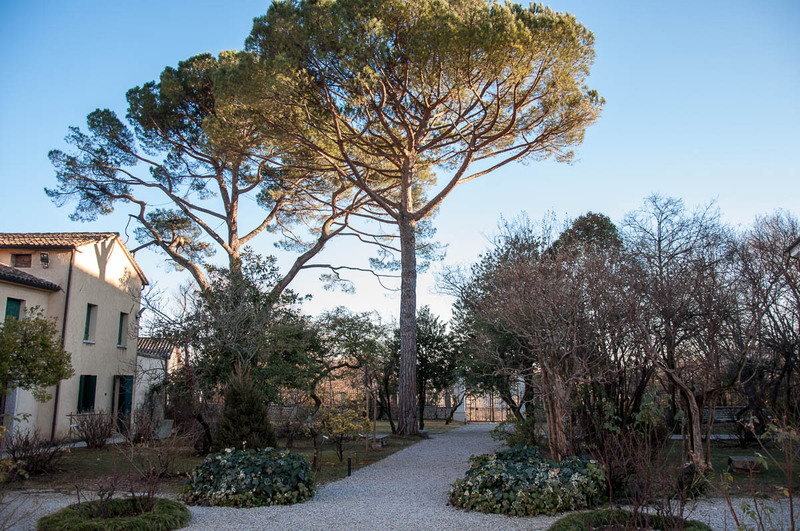 Despite being winter the garden looked well designed and well looked after, with tall maritime pine trees and little signs indicating the names of the different flowering shrubs. In spring and summer it must be absolutely gorgeous when it is all in bloom. There was also a small courtyard with a well which was also very picturesque. The house had three floors and contained a large number of pieces of art. I loved seeing Canova’s etchings with their perfect classical scenes. My favourite one was called Mercato degli Amorini (click on the link to see it) and it featured the god Hermes picking tiny cherubs out of a metal cage to give to pretty young nymphs. Later on I bought a magnet with a picture of this particular etching from the museum shop. It now takes a pride of place on our fridge. 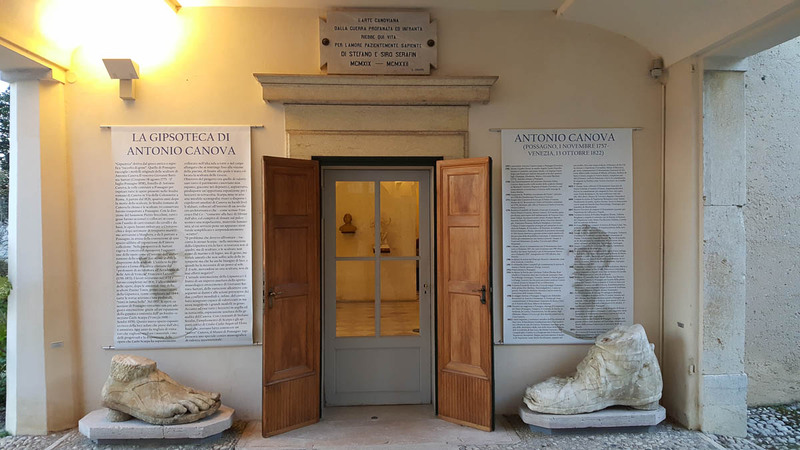 On the ground floor of the house we also saw Canova’s studio where a detailed explanation of his working process was provided and a rich collection of the tools he used was displayed. Next, we explored the Gypsotheca and its 18th century and Scarpa halls, where we marveled at Canova’s art. His strong, powerful male bodies, his graceful females and their faces with striking classical features. In a way, it felt like we were in the Accademia in Florence, surrounded by a sea of art. The difference being that all we saw around us had been borne by the mind and the hands of one man. And even though these were not the actual Canova’s marble statues which nowadays grace the collections of museums all over the world but their original plaster casts, it was a great way to get a visual idea of how much a person can achieve in his lifetime if he puts his mind to it. It was now getting late and dusk had fallen outside. 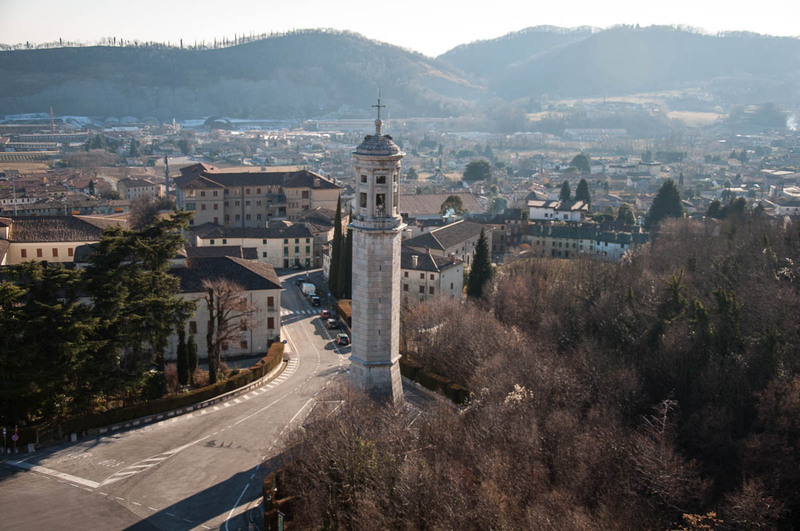 So, after one final look at the statues and the bas-reliefs, and after a quick coffee with Italian sweets in a nearby cafe, we headed from Possagno back to Vicenza via Veneto’s curving roads. 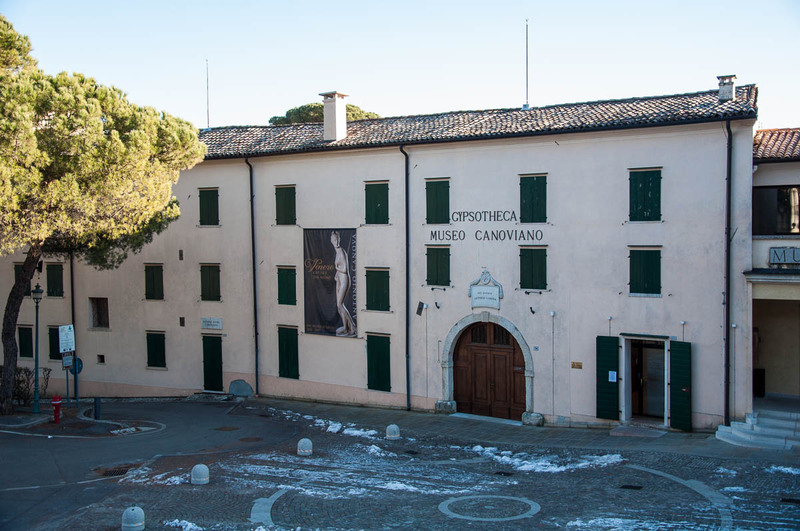 Find more information about Canova, his life and his art at www.museocanova.it.